The beginning of this generation was a disaster for NHL. Already a year late to the party, it launched with underwhelming additions and missing features, most notably its flagship mode the EA Sports Hockey League. But after five years NHL appears to have turned things around, and in a big way. NHL 19 finally brings much-needed improvements to the skating via the Real Player Motion or "RPM" tech, making carves and crossovers feel more realistic and responsive. It also includes a physical overhaul that makes players feel bigger and nastier without being cartoony. Players will anticipate and follow through on their hits, giving them a satisfying punch. It's already a nice step over last year, which felt dated at times. In NHL 18 players wouldn't so much skate as sort of float across the ice; hits were either too soft or ridiculously hard, and defensive AI was eminently exploitable. NHL has made several improvements to the gameplay over the years, but until now the locomotion has always been fundamentally the same. It's a relief to see some much-needed improvements to the foundational gameplay, and the difference is noticeable when playing. This is on top of the strong improvements NHL has managed to make elsewhere. Where FIFA, Madden, and the rest have chosen to focus on narrative experiences and Ultimate Team, last year's edition of NHL put its resources into the team-based EASHL and arcade modes like NHL Threes. It also made notable strides in the franchise mode department, adding much-requested features like custom teams, expansion, and custom leagues. NHL remains one of the two EA sports franchises to delay the transition to Frostbite, but even that is perhaps to NHL's benefit, as FIFA in particular has experienced only marginal gains while struggling with optimization issues. NHL producer Sean Ramjasingh says of the Frostbite Engine, "We're still evaluating. It's not easy getting on a new engine, it's kind of like a console transition. We're monitoring FIFA and Madden and learning about the successes and challenges they've had." In the meantime, NHL has grown into a solid, well-rounded sports sim. And with improvements to the player movement and physics, it stands to finally make serious leaps in the gameplay department as well. But that's just the beginning for NHL 19. In an effort to build more of a persistent online platform (I know), EA is introducing "World of Chel," which will allow you to customize your avatar with some 900 customization items, including hoodies, parks, and hats. It feels a bit like a cross between NBA 2K's MyPark and Forza Horizon's festivals, with DJs and scenic resorts like Whistler giving its environments a party vibe that is often absent in EA's normally sterile sports sims. The look is meant to pull in fans who aren't necessarily into the NHL, Ramjasingh says. "There are some players who don't relate to the league, but love hockey." One of the new modes within "World of Chel" (forgive me, I'm still struggling with the name a bit) is NHL Pro-Am—a series of challenges inspired by outdoor pond hockey. It also includes Ones, a new free-for-all mode in which three players battle to steal the puck and score. It doesn't sound like much, but it's a surprisingly fun and chaotic way to showcase your individual skills as you avoid your opponents and try to score. If one players gets too far ahead in the points tally, the other two can gang up on them. Games take place in picturesque locations like the Rocky Mountains, with players wearing their individualized outfits. NHL may not feature the Winter Classic, but it's still taking its game outside. In introducing these elements, it's clear that NHL is shooting for something akin to NBA 2K. But Ramjasingh says there will be no in-game microtransactions. "Nothing is monetized because we want it to be diverse." Sadly, these cool outfits don't translate into EASHL, which strikes me as an odd choice. Ramjasingh says that he wants to retain the unified league feel of the mode, but it risks making the outfits feel superfluous. It will ultimately depend on how expansive "World of Chel" (god, it's just the worst) ends up feeling. NHL Ones is structured somewhat like Clash Royale. If you win, you'll be promoted to upper tiers. If you lose, you'll be demoted. 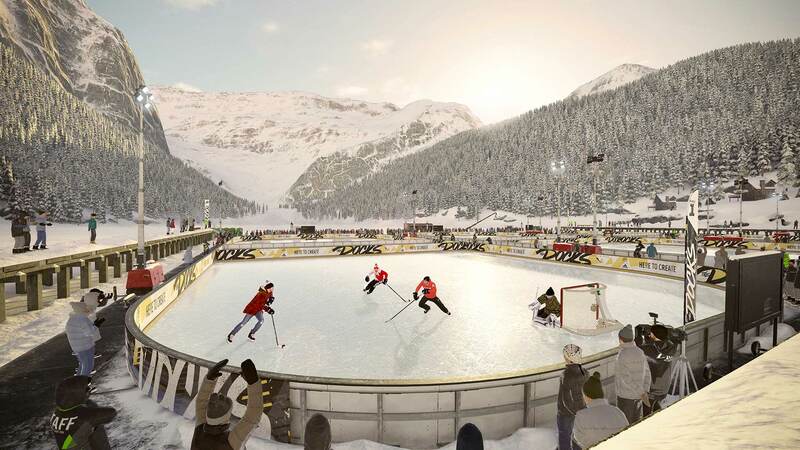 Each new tier is represented by a different rink, culminating in a nighttime vista in British Columbia's Whistler resort. In addition to cosmetics, NHL 19 will include trait and specialization loadouts. Some of the abilities include "Booming Slappers," "Dirty Dangles," and "Tight Turns." NHL 19 will feature 200 alumnia players including Wayne Gretzky. Even better, they're finally being set free from Hockey Ultimate Team. They will be available in multiple modes including franchide. Yes, I am putting Wayne Gretzky on the Minnesota North Stars, thanks for asking. This year's cover athlete is P.K. Subban, which is a fine choice. Of course I would have picked Alex Ovechkin doing a keg stand out of the Stanley Cup, but that's just me. All told I really like where NHL is going right now. Where other sports sims are dour esports wannabes or straight-up microtransaction machines, NHL is embracing its arcade roots in a way that I find refreshing. Its franchise and online team modes are second only to NBA 2K right now (lack of the Winter Classic aside); and if it gets the gameplay right, it may well be my favorite sports sim of the year. Who needs Alex Hunter and the Frostbite Engine, am I right? So after a mostly forgettable generation, NHL finally seems to have some momentum. Now if EA will only just bringing back online franchise mode, I'll be ready to call it my game of the year. NHL 19 will release on Xbox One and PS4 on September 14. Tagged with Analyses,	Electronic Arts,	PlayStation 4,	Sports,	Xbox One.